– concerned with the protection, preservation, study and appreciation of Scottish buildings. – a membership forum for understanding, promoting and influencing the dynamic relationship between the historic environment, new design and sustainable development. – the lead public body set up to investigate, care for and promote Scotland’s historic environment. It was formed by the merger of the Royal Commission on the Ancient and Historical Monuments of Scotland and Historic Scotland in 2015. – bringing to a wider public an understanding of all the places and buildings that have been used for worship in Scotland, regardless of faith, denomination or present condition. – looks after the Scottish canals, conserving them as part of our heritage, and transforming them to play a vital role in Scotland today. – the umbrella organisation for all individuals and groups interested in local history in Scotland. – the senior antiquarian body of Scotland, promoting the cultural heritage of the country. – a semi-autonomous group of SPAB members in Scotland. SPAB is the largest, oldest and most technically expert national pressure group fighting to save old buildings from decay, demolition and damage. – aims to identify all the Scottish brick makers back through the generations and to preserve physical examples of their bricks. – dedicated to the protection, preservation, study and appreciation of Scotland’s historic buildings. – a forum for all professionals working in the field of architectural conservation. – a permanent repository for the documentary and photographic records of traditional and contemporary mills and milling. – encourages expertise and understanding in the appropriate use of building limes. – an independent charity bringing together members, supporters and partners to give archaeology a voice and safeguard it for future generations. – includes a Scottish branch. – the first organisation worldwide focused solely on historic ironwork. – studies the rich diversity of British regional furniture-making traditions, and the social and cultural context of furniture from the earliest times. – studies English and Welsh vernacular building traditions, with links to over a dozen local and regional groups. – a blackhouse, preserved almost as it was when its crofting occupants departed in 1966. – the most complete surviving example of a Highland farm township, a type of settlement representative of much of Scottish rural history. – Scotland’s most splendid and complete example of a 17th-century townhouse. –17th-century house in which Robert Burns learned to dance, founded a debating club and became a Freemason. – a working watermill built in 1873, and grinding bere (an ancient form of barley). – two rooms have been recreated to appear as when Barrie was a boy. – a 19th-century working mill. – the small, sparsely furnished house in which Thomas Carlyle was born in 1795. 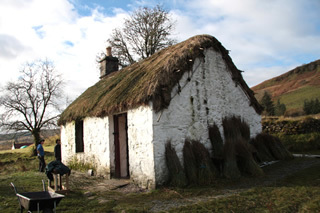 – a traditional croft house depicting how islanders lived in the 19th century. – a traditional late 19th-century Orkney farmhouse and steading. – an example of a type of construction that was common in the 18th and 19th centuries. – one of the oldest and tallest grain mills surviving in Scotland. 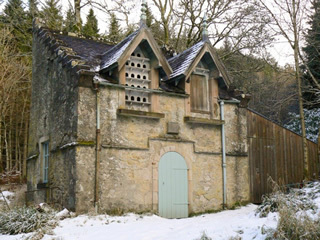 – Britain’s first open air museum; it collects buildings representative of different aspects of Highland vernacular architecture. – a thatched fisherman’s cottage that was the birthplace and early home of the eminent geologist, writer and social commentator. – a 200-year-old rush thatched Caithness longhouse. – a 16th century homestead with a central hearth and stone neuk bed. 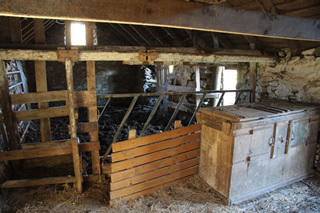 – a cruck-framed farmhouse with byre attached, and many original features. – East Lothian’s last working water mill, and a 16th-century doocot. – the most complete example of a Scottish Burgh of the 17th and 18th centuries. – a traditional croft house and steading with thatched roof, mill and outbuildings dating from the 1870s. – a small township of thatched buildings illustrating island life at the close of the nineteenth century. – an 18th-century cobbler’s cottage with workshop and living quarters. – a laird’s townhouse that contains the Orkney Museum. – an 18th century lead mine, miners’ cottages, and the second oldest subscription library in Europe. – an 18th-century handloom weaver’s house. – supports research, learning and teaching with freely available, high quality and dependable digital resources. – contains over 11,000 references and access is free. – provides information on products and services for the conservation of historic buildings. 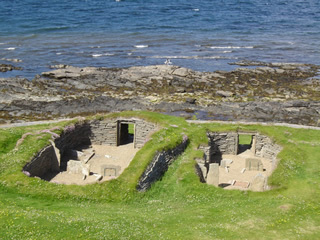 – the online catalogue for Scotland’s archaeology, buildings, industrial and maritime heritage. – Glen Pride’s invaluable glossary of Scottish building terms. – Jean Manco's valuable resource. – selects, preserves, and makes available the national archives of Scotland. – the map images online are particularly valuable. – records Scottish brick makers, and preserves and illustrates examples of their bricks. – national databases for accessing historical resources relating to places throughout Scotland. – hosts images, movies and sounds from museums, galleries and archives.